​Our company is committed to providing a fun, educational, and environmentally friendly wooden stacking game to those who wish to spend quality time with friends and family. We wanted to provide you with something new to challenge yourself and your mind. Our carefully designed game pieces are hand crafted from American hardwood by American Craftsmen. Our game pouch is made from 100% American cotton and hand made by American workers. 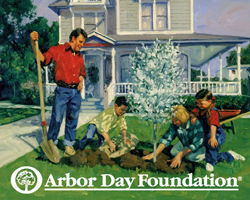 A portion of company proceeds is donated to The Arbor Day Foundation to help with the sustainability of the world’s forests and eco-systems. With every purchase of our wooden puzzle game, we get a little closer to a more sustainable world. We also proudly support the “Rails-to-Trails” Conservancy, helping create healthier places for healthier people. Help us be environmentally responsible by purchasing our stacking block game. Besides being environmentally responsible, our company also strives to offer a fun and educational opportunity for people who buy the game. This KBitz game will test your manual dexterity, spatial reasoning, problem solving, and team building skills. And finally, it’s a fun way to interact with family and friends. Whether you’re age 8 or 80, this game is for you. Test your skills with our brand new game! Games Sold = More Trees & Trails!